A unified view for fleet visibility, intrusion detection, vulnerability management and compliance across operating systems and computing environments. Continuous monitoring and security built for the ephemeral nature of cloud workloads and containers. Intrusion detection, vulnerability monitoring and configuration compliance, purpose built for macOS. For Linux, macOS, Windows, containers and cloud workloads. Instant access to the who, what, when and where at the individual Macbook and global fleet level. Go beyond osquery data collection - aggregate, correlate and analyze system data with Uptycs. A challenge in the modern enterprise is juggling the numerous point security solutions — each with their own data collection strategy — especially across a diverse ecosystem of IT assets. Uptycs combines the universality of osquery with meaningful views of data. 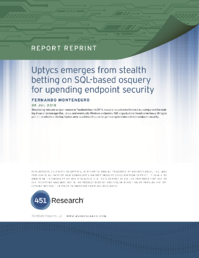 as he shares his take on osquery, Uptycs and the evolving endpoint security landscape in the report. Deploy and scale Uptycs across your infrastructure in minutes - whether to 50 or 500,000 endpoints - and start realizing the value of osquery analytics, instantly.